by David Osborn, MH, L,Ac. Hakim Ajmal Khan was the pioneer of Unani Medicine in modern India, as well as a freedom fighter and an associate of Mahatma Gandhi in the Indian independence movement. He was a populist and a nationalist, and fought hard on behalf of India's indigenous systems of traditional healing, both Ayurveda as well as his own tradition of Unani Tibb, against the British policy of suppressing indigenous healing systems in favor of Western medicine. He believed that Unani and Ayurveda should work together like a pair of eyes, and to this end, founded the Ayurveda and Unani Tibbiya College in Karol Bagh, Delhi. Hakim Ajmal Khan was born on February 11th 1868, into a long line of Unani doctors, or Hakims, who first came to India during the reign of the Moghul emperor Babur in the 13th century. Hakim Ajmal Khan was the 17th Shawwal or title holder of this lineage of Unani physicians, and his family was known as the Rais of Delhi. His gradfather was Hakim Sharif Khan, who was the personal physician to the Moghul emperor Shah Alam; his gradfather also built the Sharif Manzil Unani hospital and teaching college, where the poor were treated for free. Hakim Ajmal Khan was the scion and heir of the Sharifi family or lineage of Unani Hakims, otherwise known as the Delhi school. As a child, Hakim Ajmal Khan learned the Quran by heart, and also received a traditional Islamic education, which included the study of Arabic and Persian. He then turned his attention to the study of medicine under the guidance of his senior relatives, all of whom were well-known physicians. Hakim Ajmal Khan completed his studies of Unani Medicine under Hakim Abdul Jamil of the Siddiqui Dawakhana in Delhi. In 1892, Hakim Ajmal Khan qualified to become a Hakim, and became the chief physician to the Nawab of Rampur. His fame and reputation spread, and he earned the title of "Massiha-e-Hind", or "The Healer of India", or "Massih-ul-Mulk", or Healer of the Nation. He was also called "A King Without a Crown". Like his father, Hakim Ajmal Khan was said to have a magical medicine chest, and was renowned for his miraculous cures. He was said to be able to diagnose a person's illness just by looking at his face. Hakim Ajmal Khan charged a 1,000 Rupee fee for an out-of-town visit, but those who came to visit him in Delhi he treated for free. Hakim Ajmal Khan took an avid interest in promoting the expansion of Unani Medicine, and to this end, he built and founded three institutions. The first was the Central College in Delhi; the second was the Hindustani Dawakhana, his dispensary of Unani medicines; and the third was the Ayurveda and Unani Tibbiya College in Karol Bagh, Delhi. Another institution that Hakim Ajmal Khan was instrumental in founding was Aligarh Muslim University, in Aligarh, under the directorship of Sir Syed Ahmed Khan, and was appointed a trustee of the college, and its first chancellor. Aligarh Muslim University still has a Tibbiya College named after him. Hakim Ajmal Khan saved Unani Medicine from extinction in India and infused new life into the decaying Unani system of medicine, which had suffered badly under British rule. In diametric opposition to the more traditional Lucknow school, Hakim Ajmal Khan proposed the absorption of Western ideas and concepts into the Unani system of medicine. Hakim Ajmal Khan banded together with his fellow traditional physicians to protest the British Raj. His interest in preserving Unani Medicine naturally flowed over into preserving other aspects of traditional, indigenous Indian culture and civilization, and his political interests and activities were a natural outgrowth of his advocacy of traditional healing, and defending it against the Western cultural and political chauvinism of the British colonialists. As a nationalist and freedom fighter, Hakim Ajmal Khan began writing for the weekly magazine Akmal Ul Akhbar, which was launched by his family. Hakim Ajmal Khan also headed a delegation that met with the Viceroy of India in Simla in 1906, in which he presented the Viceroy with a memorandum written by the delegation. At a time when many Muslim leaders were facing arrest, Hakim Ajmal Khan reached out to Mahatma Gandhi, and to other Muslim leaders to form the Khilafat movement. He was also present at the inauguration of the All India Muslim League on December 30, 1906. Hakim Ajmal Khan was elected president of the Indian National Congress in 1921, and joined with other Congress leaders to condemn the notorious Jallianwallah Bagh massacre. 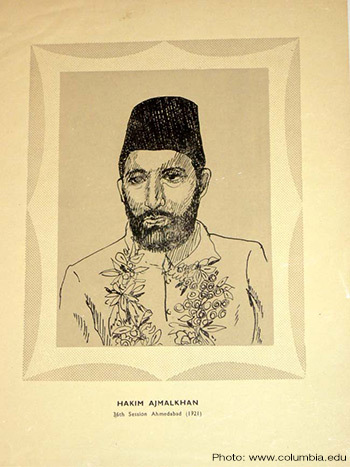 Hakim Ajmal Khan deeply understood the need for Hindu - Muslim unity, and was probably the Muslim leader of the Indian independence movement who was closest to Gandhi. Hakim Ajmal Khan has been called a versatile genius, with a brilliant, charismatic personality and an aristocratic bearing. He was a true renaissance man of varied passions and interests, which included even literature and poetry. As the court physician to the Nawab of Rampur, Hakim Ajmal Khan hobnobbed with the aristocracy of India, but he was also a populist, and a man of the people. Coming from a distinguished tradition of Unani healers, he was not content to rest on his laurels, or to dwell solely on the glories of the past, but was also a modernist and progressive where he saw this to be fitting and appropriate. As a friend of the aristocracy, Hakim Ajmal Khan was frequently invited out on hunting expeditions with the rich and powerful, but refused to do any of the shooting, due to his conviction that a Hakim should not take life but give it. Hakim Ajmal Khan came onto the stage at a critical moment in the history of the Indian subcontinent, and his life bridged the traditional and colonial India of yesteryear with the modern, independent India that was emerging. Not only were his efforts and activities crucial in the Indian independence movement, and crucial for bringing Unani Medicine into the modern age and ensuring its survival, but he worked hard to promote the status of traditional healers, both Ayurvedic Vaidyas as well as Unani Hakims, within the social structure and the medical profession of modern India. According to Hakim Aslam Javed, head of the Hakim Ajmal Khan Memorial Society, the prestige and position that both Unani as well as Ayurvedic healers enjoy in modern Indian society is largely due to his tireless efforts on their behalf. As a part of bringing Unani Medicine and the other indigenous traditional healing systems of India into the modern world, Hakim Ajmal Khan recognized the vital importance of laboratory research and clinical trials in proving the therapeutic efficacy of traditional Ayurvedic and Unani medicinal herbs. Perhaps the best known example of this is his collaboration with the chemist, Dr. Salimuzzaman Siddiqui, to chemically isolate and analyze the active pharmacological constituents of the indigenous Unani and Ayurvedic herb Asrol or Pagal Bhooti, whose Latin botanical name is Rauwolfia serpentina. This led to the discovery of the modern drug Reserpine, which is used as a sedative, and to lower blood pressure. Traditionally, the whole herb has been used to treat hypertension, hysteria, insomnia and various neurological, neurovascular and psychosomatic disorders. As a traditional Unani pharmacist, Hakim Ahmal Khan is credited with developing and patenting some 84 different Unani herbal formulas with an almost magical efficacy. In modern India and Pakistan, there are traditional Unani medicine manufacturers, called Dawakhana, who either see Hakim Ajmal Khan as their founder, or look to him as a guiding inspiration. The Dawakhana Hakim Ajmal Khan, (Pvt.) Ltd., of Lahore, Pakistan is a good example, and was founded by the grandson of Hakim Ajmal Khan, Hakim Mohammed Nabi Khan, in 1948. Their website address is: www.ajmal.pk . Although Hakim Mohammed Nabi Khan was trained at the Ayurveda and Unani Tibbiya College in Delhi, which was founded by his grandfather, he subsequently settled in Lahore, Pakistan, where he founded his Dawakhana. Much has been made of the religious animosity between the Hindus and the Muslims in the partition of India and Pakistan, but that situation is not as clear and unambiguous as it seems. Before partition, there were Hindus and Muslims living together, side by side, on both sides of the India / Pakistan divide; when I visited Delhi to study Unani Medicine, I befriended a local Ayurvedic doctor whose family had lived in Lahore prior to the partition of India and Pakistan. And, in the midst of Delhi, where I befriended him, there were many Muslims living there as well. On a visit to Jamia Hamdard University, which houses an important Unani Tibbiya College in Delhi, I met a couple of elderly Muslim gentlemen who told me, to my astonishment, that the vast majority of people, both Hindu and Muslim, who lived in the Indian subcontinent at the time of partition were not in favor of a two state solution - that was imposed on them by the British, for political and geopolitical reasons. One of the things that the partition of India and Pakistan did was to split up the Punjab, which had been a hotbed of resistance to the British in the struggle for Indian independence; in fact, Jallianwallah Bagh, where the infamous massacre took place, is in the Punjab city of Amritsar. Traditionally, Unani Medicine, as it was practiced in the Indian subcontinent, has pretty much been a family affair, and to a large extent, it still is. The two major family traditions or schools of Unani Medicine in India are the Sharifi family and its Delhi school, of which Hakim Ajmal Khan was the scion and heir; and the Azizi family of Lucknow, which I mentioned earlier as being of a more purist, traditional approach. The Sharifi family of Delhi favored more innovation, as well as a polypharmacy approach to herbal medicine; the Lucknow school and the Azizi family preferred to use single herbs, which herbalists call the art of simpling. Unani Medicine was also patronized by the Muslim aristocracy, first by the Delhi Sultans, then the Moghul emperors, and then by other Muslim nobility, such as the Nawab of Rampur, and most famously, the Nizam of Hyderabad in southern India. When I visited India in 2007 to do research, study and observation of Unani Medicine for my website, I met a good number of students in the Unani Tibbiya colleges there who had come from long lineages of Unani Hakims. Herbal medicine and healing was the family business, and they were going to school mainly to get licensed and legitimized in the eyes of the government in a discipline that they had been informally learning and practicing since childhood. Medicine is not just theory and didactic instruction; it's also practical knowledge and clinical experience, and these young Tibbiya college students already had a good head start in the crucial practical, clinical aspect of the healing art. Just think - if Hakim Ajmal Khan had not come along to preserve and elevate the social standing of their family business and profession, they might have chosen some other more mundane line of work, like being a tailor or greengrocer. Although the sun of Eastern arts and sciences kept rising in its own time and many nations drew benefits from its light, now that sun has declined and the age, as is its habit, has given birth to a new sun that fulfills the needs of the people of the age... The results of this reversal, which previous nations have already endured, will happen to us: We will see our former greatness and glory in the hand of oblivion if we do not take thought to preserve it.